2. Simply attach the sender unit to the circuit and follow the wires using the detector. 3. Find short and open circuits fast and easily. 4. Suitable for all DC circuits with voltages between 6 and 42 volt DC. 5. Ideal for automotive repairs. 6. Powered by two 9V batteries. -Quickly and easily locate short circuits. -Save your times and increase your income. -Judge continuty of the cables or wires. -Track the cables or wires, and diagnose the break point. -Receive the tone signal on the cables or wires(telephone line). -Indentify the state in the working telephone line (clear, ring, busy). -Send a single solid tone or a dual alternating tone to the object cables or wires. -Power Supply: Two 9V batteries Required (Not Included In Package) . 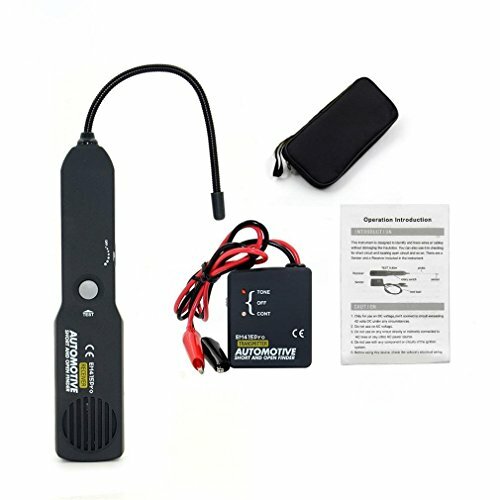 Short & Open Circuit Finder Tester Voltage: 12V; Power Supply:Two 9V batteries Required (Not included in package); And it comes with manual, easy to use. It will work on all kinds of circuits with voltages between 6 and 42 volt DC. (such as those found in automobiles,trucks,tractors,boats,RVs,etc...With its wide working voltage range.). Locating Open Circuit: It detects and alerts you immediately where a circuit is open. You can quickly and easily Locate short circuits, open connections, broken wires, current leaks and even trace wires. Checking Short Circuit: You can also find intermittent circuit problems by flexing wires or connectors and listening for a change in the receiver tone. Allowing you general tracing or pinpointing the problem location. It also shows you the direction to the short with its direction indicator,eliminating the guesswork. If you have any questions about this product by VECANCE, contact us by completing and submitting the form below. If you are looking for a specif part number, please include it with your message.